You’ve arrived in Istanbul in the morning but you can’t check into your accommodations until late afternoon (usually around 3pm). Hotels and B&Bs often offer to hold your bags until you can check in, but if you’ve booked a private apartment you may be in a quandary about where to leave your bags in the interim. 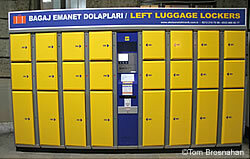 Alas, Istanbul no longer offers staffed storage facilities in their train stations, however the good news is that self-service luggage lockers are still available at some of Istanbul’s railway stations and the main bus terminal. 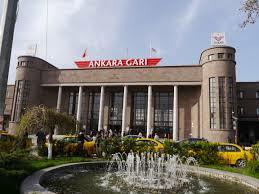 The Ankara Gar station, for instance, is less than a kilometer southwest of Ulus Square in the historic district and has ample banks of brightly colored lockers where you can place your bulky, heavy bags while you stroll around the center. If you find yourself at Istanbul’s Atatürk International Airport with a long layover (four hours or more), you can leave your luggage for safekeeping and take the metro or tram into the city to see the sights. 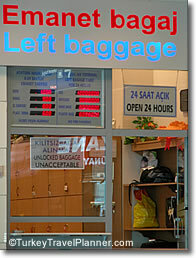 Emanet Bagai is located outside the customs area. Once you exit, turn right and walk toward the end of the terminal. There are also baggage lockers in the Departures Hall of the International terminal (at the far end of Row B check-in desks near the toilets/WC). *Note: You’ll need to allow about an hour to return to the airport to retrieve your bags before catching your next flight. The lockers are available 24-hours a day, 7 days a week, including holidays. You pay by the hour, so it can be a bit pricey but it can be worth it – having peace of mind knowing your bags are safe and you’re free to see the sights without having to drag your bags behind you. Were I to choose my religion based solely on the places of worship, there’s no doubt it would be Islam. Coming from Rome, with over 400 churches, it’s amazing to see the contrast in Istanbul - the largest city in the middle east, with the greatest number of active mosques (almost 3,000). When we think of typical mosque architecture, with the dome and minarets, we’re really thinking of Ottoman mosque architecture, developed in the 14th and 15th century. Normally when I travel, I don’t do much sightseeing unless I can do it with a knowledgeable guide who can help me understand and appreciate it properly. I prefer taking one guided tour on a specific subject that’s really in depth rather than spending a week on my own roaming around sites that I don’t fully connect with. So in Istanbul, to better understand the history of the mosques (which in turn reveals a great deal about the relationship between people and their religion) I went on 3 hour walk by Context Travel (which lasted 5 hours! 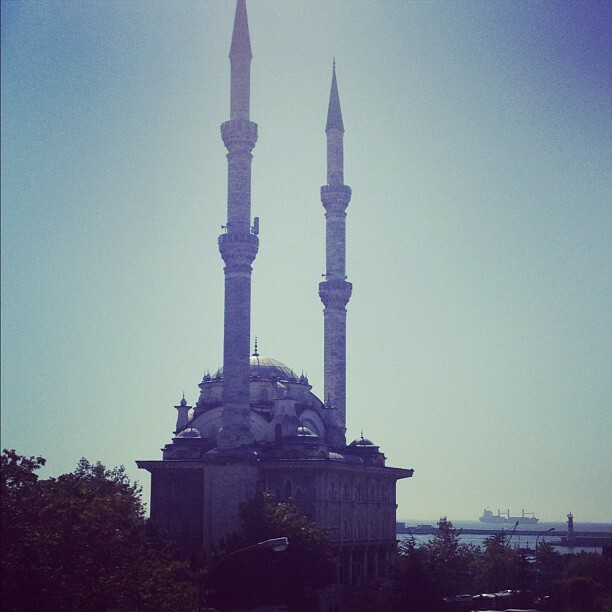 ), focusing on just 2 of the most important mosques designed by Sinan, the great Ottoman architect. 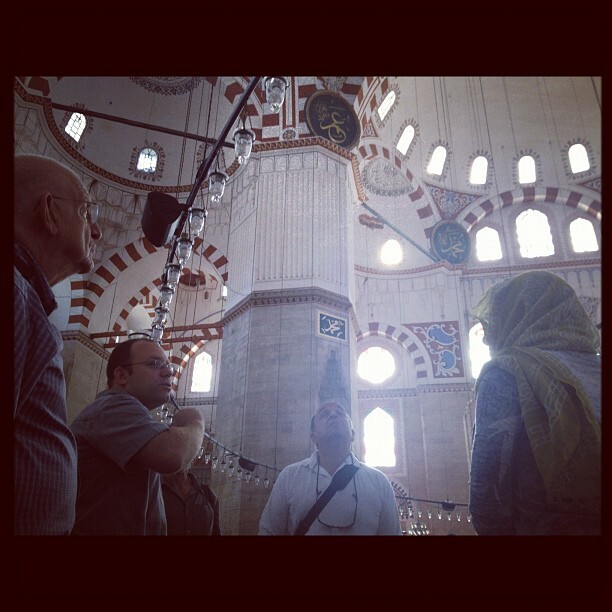 We visited Sehzade Camii, dedicated to Suleyman’s son, Prince Mehmet and the complex of Sultan Suleyman “the Magnificent”. After taking off our shoes, careful to not touch any sacred ground, we would sit and discuss the various elements of each building, using photocopied images from our guide to help put things in context. The Catholic churches of Italy that I’m so used to – those overwhelming, overly ornate places with so much iconography - don’t always succeed in making me feel closer to God. 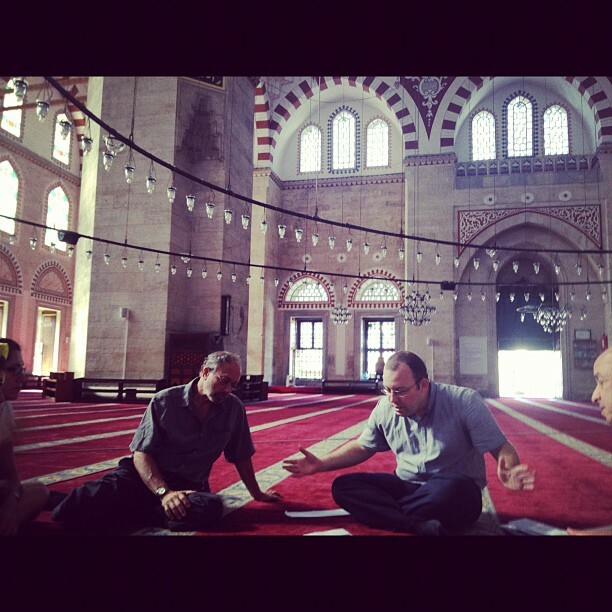 In Sehzade Camii, my first impression is how nice it is to not have every inch of space covered with images and stories. 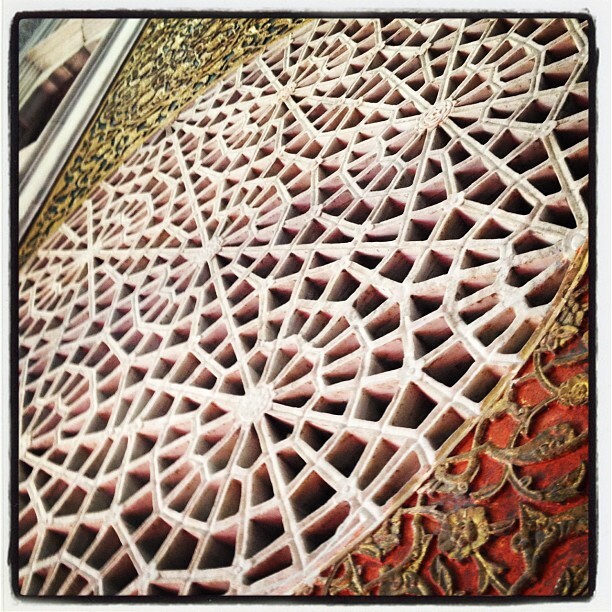 Instead, there’s beautiful Arabic script flowing along the walls and ceiling. My second impression is how much what seems to be decoration is really so much more. The Islamic scholars were very advanced mathematically. This geometry is symbolic of the universe – a place of elegance, of sense, of structure, and this sacred mathematics seemingly brings us closer to God. 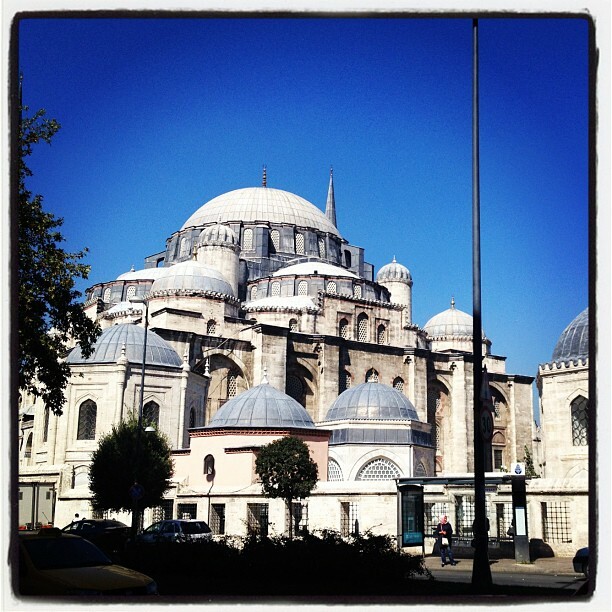 Visiting the Hagia Sophia and the Blue Mosque are of course on everyone’s list of sites to see in Istanbul. I highly recommend visiting Sehzade Camii and Suleyman’s, especially with a knowledgeable guide. Here’s a little video interview I did of our guide and expert, Yavuz Sezer. What’s the best, most central neighborhood in a city that spans over 2,000 square miles and has almost 3,000 years of history? Well, the first hurdle to get over is the idea of there being one “center” to this city and one “best” area. Many consider Sultanahmet the center of Istanbul – and although it’s a logical base to visit the main, historic sites from, it’s hardly the most interesting part of the city (unless you want chain-hotels and tourist restaurants). Many first timers choose Sultanahmet for the convenience, but Istanbul is a pretty easy city to get around in, so don’t be afraid to use public transport, and taxis are cheap. Istanbul is also one of the most vibrant, interesting cities I know and worth staying in a neighborhood that combines both the old and new, a neighborhood that feels like “home” base. 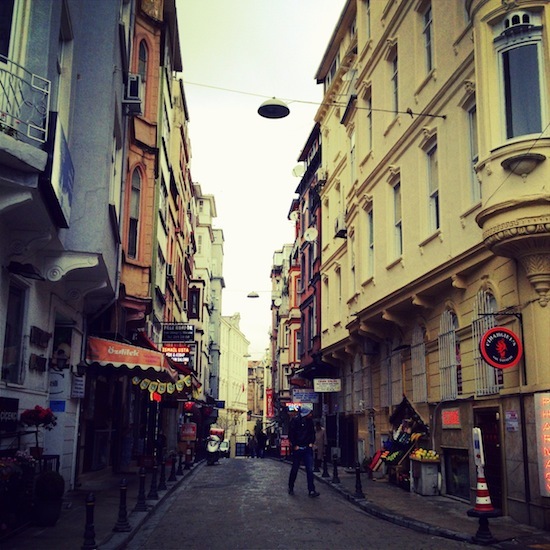 One such neighborhood, perhaps my favorite in Istanbul, is Cihangir (pronounced gee-hun-gear). This district was named by Suleiman the Magnificent during the 16th century after his son, the crown prince Cihangir, in order to compensate for the fact that he was deformed. It means, “Conquerer”. 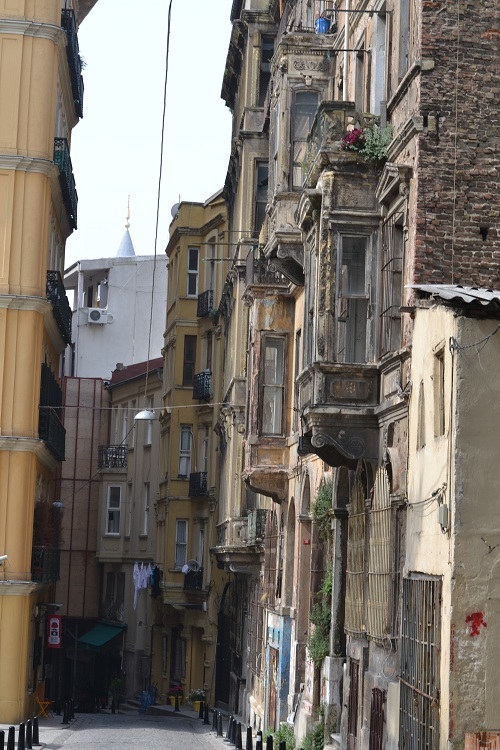 Throughout the decades, Cihangir has become a center of multiculturalism; it is still very popular among the very crowded expat community in Istanbul. 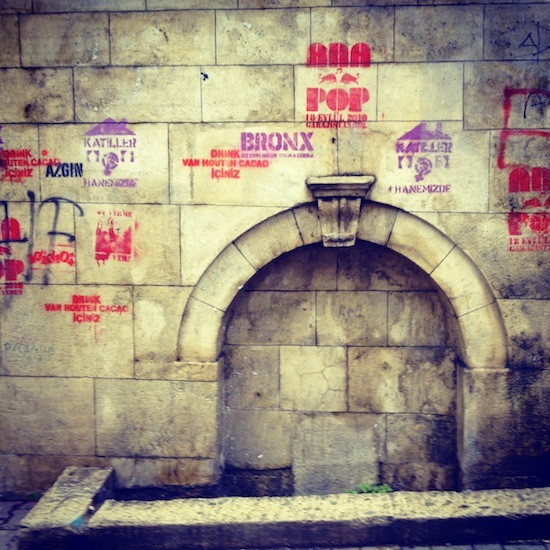 Like any other district famed for its “bohemian” qualities, Cihangir went through the stages of respectable, classic, nostalgic and now it’s part of Istanbul’s new “chic” areas, with countless cafes, and loads of great apartments for short term stays. Currently a famous Turkish sitcom, Yalan Dünya (World of Lies), uses the district as a background to the artsy, funky, the not so traditional characters on the show. Cihangir lies very close to the Bosphorus (Istanbul Strait) and the Golden Horn and since the neighborhood is up on a hill, many apartments and cafes have views of the Bosphorus and the Asian skyline. Moreover, it is only a 5 minute walk away from Istiklal Street – a total madhouse of shops, pubs and clubs that never dies down, no matter what the hour. Just before opening up to Istiklal Street, Taksim Square is the final destination of many bus lines, as well as the metro system. You will find your way to the Atatürk airport easily whether you want to use the direct private bus lines (Havas or Havatas), or the metro to get there. However, a new building project is trying to move all the traffic around Taksim Square below ground allowing for better pedestrian access. So depending on the time of your arrival you might be in for a surprise. The project is planned to be completed by August, 2013. 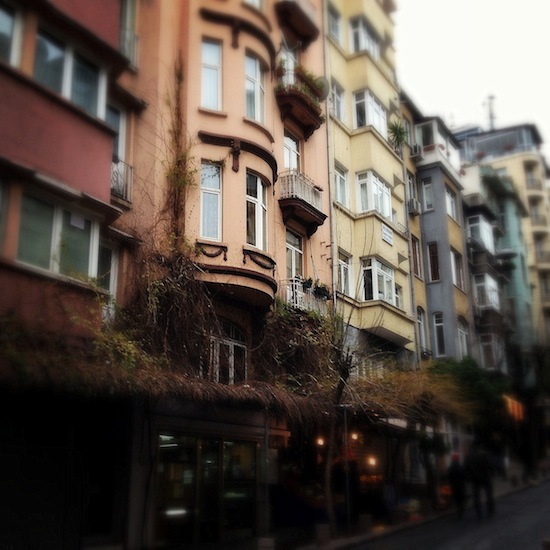 Cihangir is a neighborhood that needs to be lived in, not just visited from somewhere else in the city. It’s a place to come home to after a day of sightseeing in Sultanahmet and the best place to wake up to and go out for a hearty Turkish breakfast. Susam Cafe – great local hangout. Good for coffee or drinks any time of day. 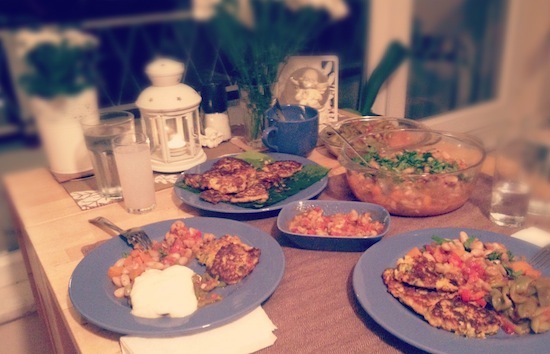 Van Kahvaltı Evi – The best place for breakfast. White Mill Cafe – Great place for a drink on their terrace. 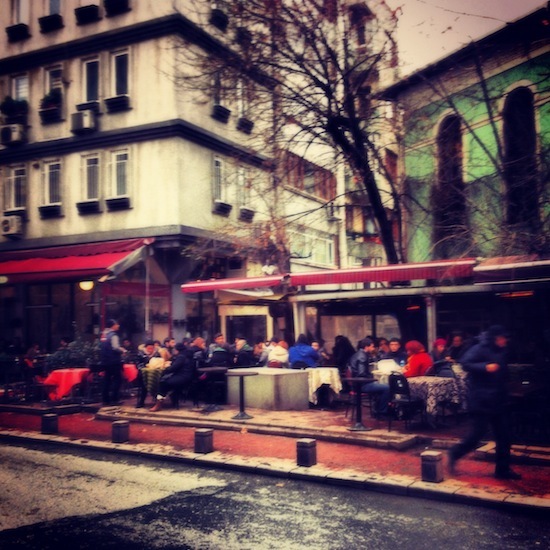 Firuzağa Kavesi – The quintessential neighborhood tea house. 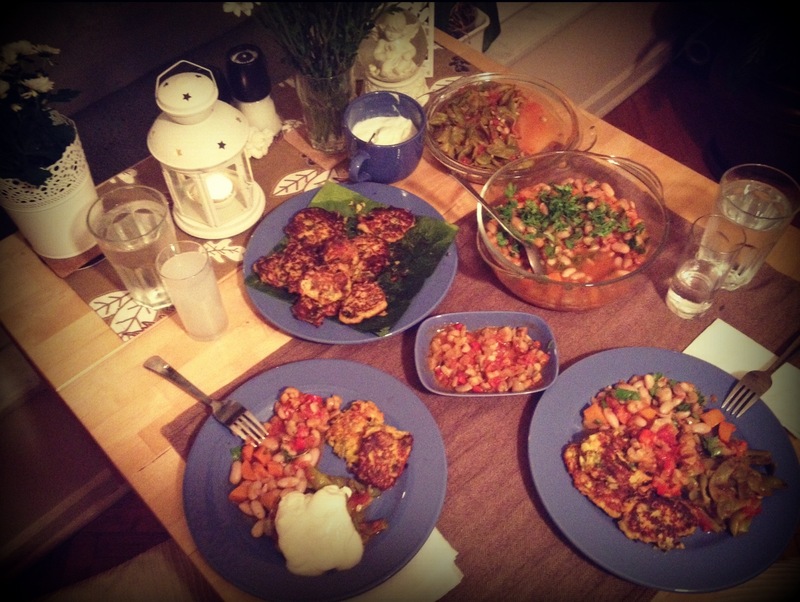 Pazi Yemek Evi – Simple, cheap and good food. The national Turkish alcoholic beverage, rakı (pronounced “rakoo”), is traditionally referred to as “the lion’s milk”. The reference is both to the milky white color that rakı turns into when diluted down by water, as is the custom, as well as to the insidious potential that it has of intoxication, with an alcohol ratio of 45%. How it’s made: Raisins and fresh grapes are distilled into “suma”, an alcoholic base, which is then distilled a second time with the addition of anise seeds, in giant copper distillers with a volume of no less than five thousand liters. The result is a crystal clear liquid with a unique taste and a strong punch for the reckless. How it’s served: Rakı is always served in small cylindrical glasses, and almost always watered down. First the glass is filled up to a third if you want a double or a “duble”; up to one sixth if you want a single or a “tek”; and only then the cold water is added. The addition of water turns the rakı into a cloudy, milky color. Most people will have an ice cube or two in their rakı to keep it cold; however since the melting ice keeps altering the concentration level of your drink expect slight changes in the taste. You are always served ample water with your rakı and you’re supposed to have a separate glass of cold water to wash it down after every sip. You might order in single servings but the tradition is to share a bottle. Rakı is nowadays produced in one liter, 70cc and 50cc bottles. 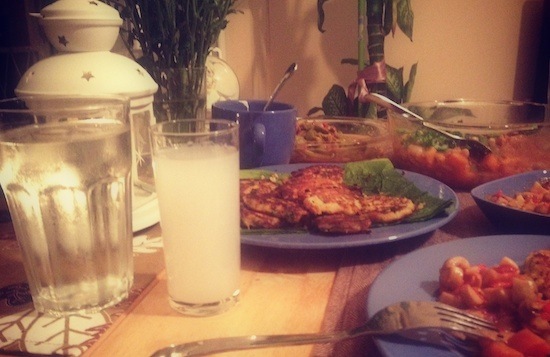 Drinking it: Mistaking rakı for just another traditional alcoholic beverage would be blasphemy. Rakı is the guilty pleasure of a Muslim culture and yet another contradiction welcoming the adventurous travelers to where the east meets the west. The closest comparison would be the tea rituals of the Far East. Even though you might walk into any pub in Istanbul to have a taste of rakı that is not the Turkish way and is only advised for the wary, in order to dodge the price of a full course meal. Even then please have at least some feta cheese with your rakı to save some face. Preferably, you should enjoy your rakı at a “meyhane”, a traditional Turkish restaurant specialized in serving rakı and the food required to complete your pleasure. Meyhanes might also have some live Turkish music; with the crowd joining in as rakı starts running down their veins. A full course meal at a meyhane will start with your selection of cold starters or “mezes”, and it is the custom for your waiter to bring a giant tray of samplers, pretty much like a 3D menu, for you to look and make your mind up. This is followed by hot starters which might include delicacies like shrimp cooked in butter. Then comes the main course which is generally some sort of fish depending on the season. 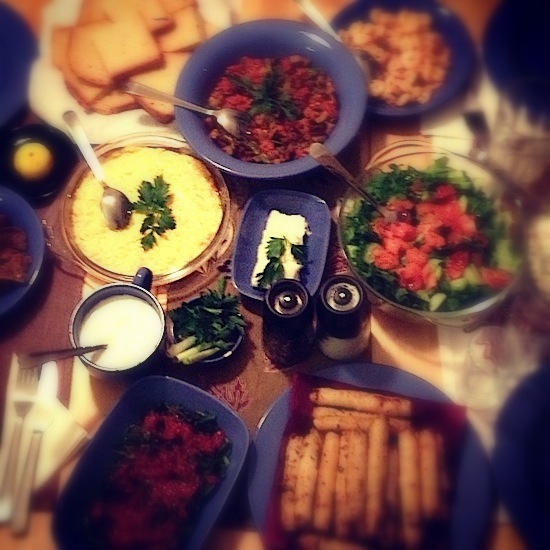 This is followed by desert, fruit and your evening reaches its peak with a cup of Turkish coffee at the end. The whole meal takes a few hours, and is not to be rushed. This is a ceremony after all and it is not about eating your fill. As you wash down every bite with a bitter sweet sip of rakı followed by a sip of cold water you will feel ecstasy and the orient engulfing you, and the next morning you are guaranteed to feel thankful for all the customary hydration. 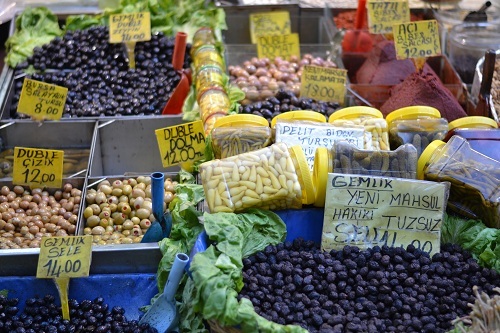 Prices: A liter of rakı will cost around 60-70TL or 25-35 Euros at a supermarket in Istanbul. The oldest and the most popular brand is “Yeni Rakı” which ironically translates as “the New Rakı”. However “Tekirdağ”, named after the city that is famous for its rak? production, is a little easier on the palate and a bit more expensive. They might charge you anywhere between 10-20TL (4-8 Euros) at a pub for a “double” rakı. A full course meal at a “meyhane” might cost anywhere between 50TL and 150TL (25-75 Euros) per person depending on the caliber of the restaurant. About the author: Ezgi was born and raised in Bolu and grew up in a boarding school in Istanbul where she met her future husband, Erkan. She studied mathematics in Istanbul and became a data analyst at a consultancy company. To make up for their years in boarding school, Ezgi and Erkan started their serious travelling during their honeymoon with Thailand as their first destination. In the following years they have explored Italy and Spain extensively (using cross-pollinate! ), to satiate their lust for great Pizza and their love of classical art. 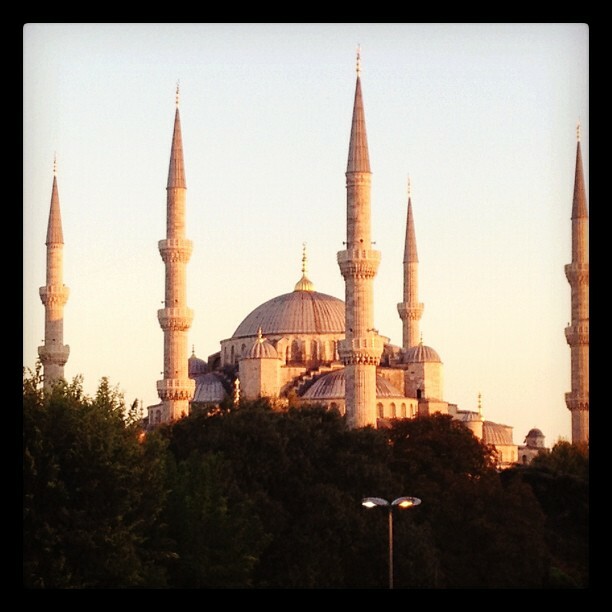 Istanbul has been our family’s home for one month. 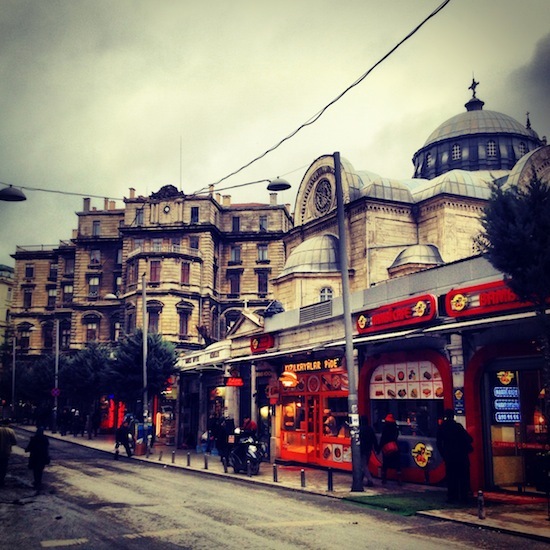 On first blush, Istanbul didn’t strike us as being child-friendly. 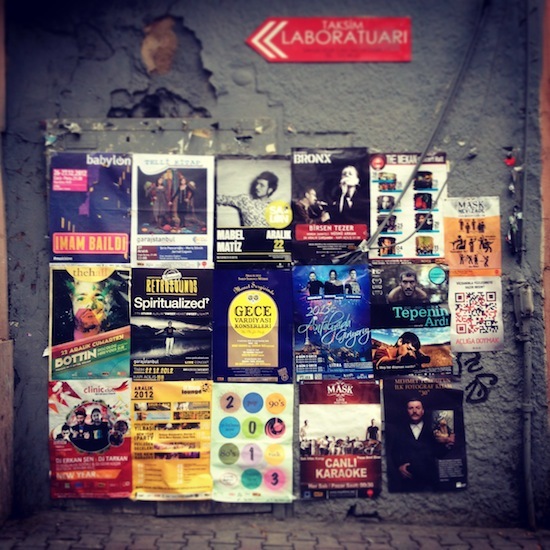 In fact, Istanbullus argue that there aren’t enough child-oriented things to do in the city. 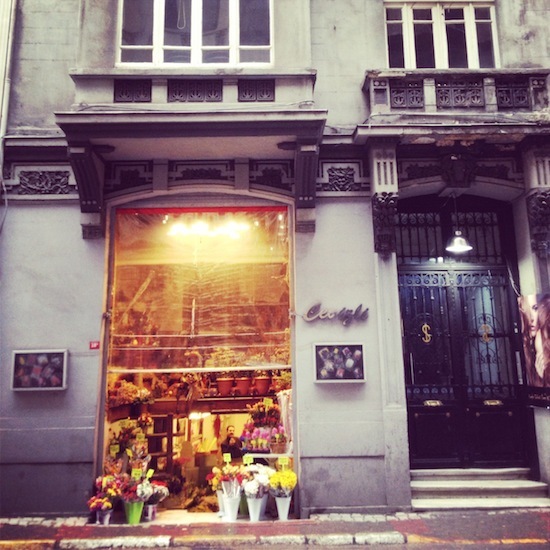 Our neighborhood of Beyoglu has a vibrant arts scene and variety of restaurants, cafes and boutiques. However, like most ‘hip’ locations, there aren’t too many things geared toward children here. While there may not be many playgrounds or green space as such, it is surprisingly easy to get around and enjoy the area with young children. My husband and I are traveling around the world, visiting ten countries in ten months with our two-year-old son and three-year-old daughter. Our stay in Istanbul comes midway through our journey and we have surprisingly found the city to be the most child-friendly so far. One of the main reasons for this is the Turkish love for children. Other countries have welcomed our children, but Turkey has embraced them. Whether we are on a tram, in a restaurant or just walking down the street, Turkish people everywhere want to entertain and help us care for our kids. Riding the tram. The tram system is easy to navigate and clean. The routes are above ground so there is plenty to distract the kids. Riders always volunteer to hold children and take it upon themselves to entertain the kids for the journey. Tip for family fun: There is a small playground just outside the Findikli stop. Kids can swing in Europe while overlooking the water to Asia. Parents can sip cay at the adjacent cafe. No other city in the world offers that combination. 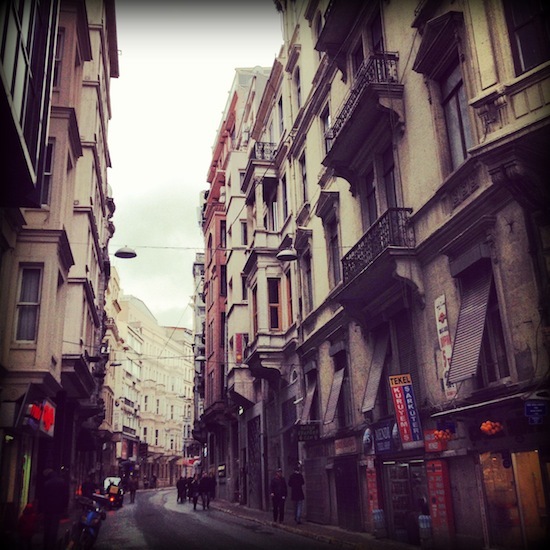 Walking along Istiklal. The crowds on this pedestrian-only street can be overwhelming, but it’s worth navigating them to people-watch and expose children to a variety of street performers. 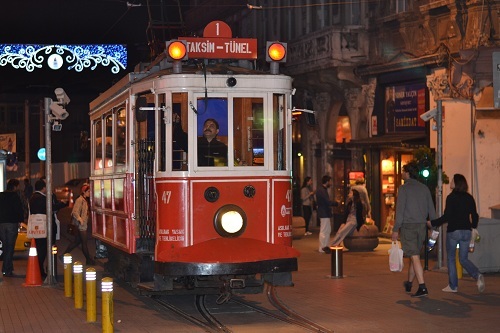 The nostalgic tram, a one-carriage heritage tram that runs the length of Istiklal is a fun ride with kids. Tip for family fun: Balik Pazari, an open-air market off Nevizade Street, sells everything from fish to exotic fruits and vegetables. In addition to the seafood restaurants there are a variety of stalls offering snacks such as fried oysters. A family can meander the colorful corners of the market, learning about and sampling ingredients like honey in the comb and smoked salmon. People-watching at Galata Tower. 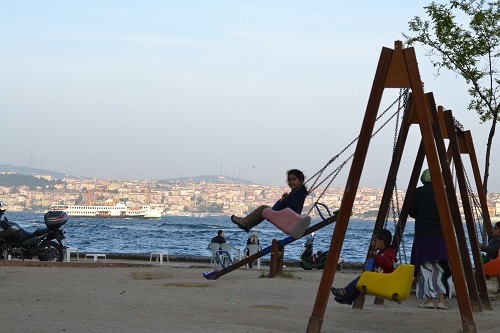 The area at the base of the Galata Tower is a great substitute for a playground. It’s a large open space without any traffic. Street performers provide good background music and there is always a plethora of kids, providing for instant play dates. A regular popcorn cart offers a good snack. Tip for family fun: While the kids play, parents can keep a watchful eye from one of the many cafes along the perimeter of the tower. Exploring side streets. The cobblestone streets around Beyoglu are lined with character, be it in the form of old buildings, new establishments, or people. It’s best to stay on the sidewalks, where they exist, as drivers can hurtle around corners unannounced. Tip for family fun: Don’t be shy about visiting any of the restaurants, cafes and little boutiques. Every single one we have been to, even those that look fancy, has welcomed the kids. Some restaurants brought out balloons to keep the kids happy; stores offer free chocolate; and boutiques love the company of little children (just don’t break anything!). 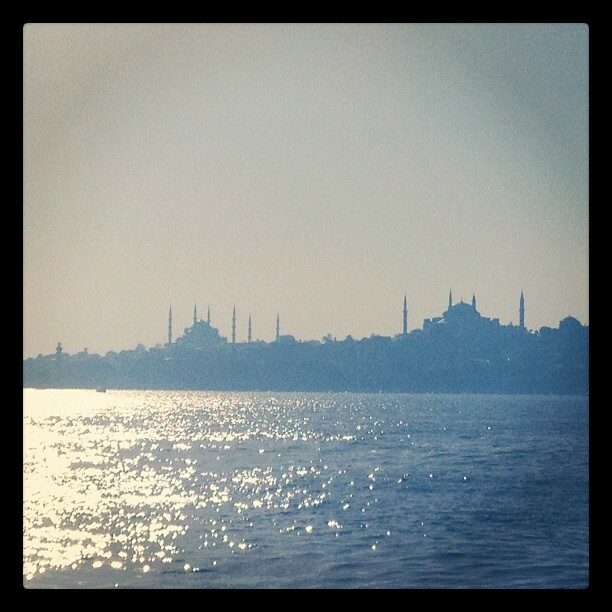 We encourage families with young children to visit Istanbul. The people will welcome your kids literally with open arms. The best part about the city is that it is possible to do things that adults enjoy while also making it fun for kids.